My first rosemary plant died a few weeks ago. My first try in planting this supposedly hardy herb. I got a small little sprig from my colleague's big rosemary plant. For the first plant, after 2 or 3 days of being in the water without any roots growing, I planted it straight to the soil. Despite watering it daily, it did not survive. My first sprig of rosemary became dried rosemary! My colleague asked if I wanted to try again. This time, I left the new sprig of rosemary in a ceramic cup with water in the office. It's unconventional, but I was hoping it will root. In about 7 days, I noticed roots were growing! I thought I would be patient and let more roots grow. 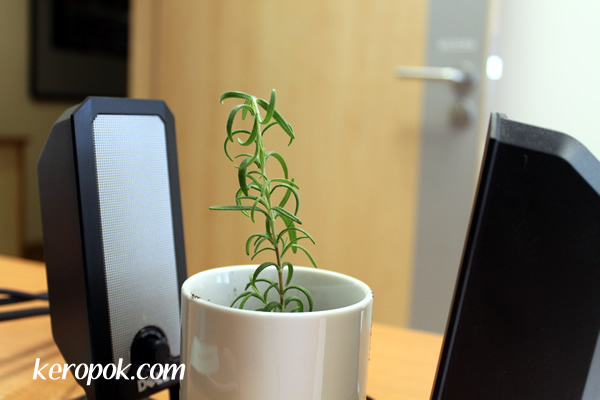 It seems the cool office temperature, office lights and water encourages roots to grow! It was growing well just on clean purified 'diamond' water from the office pantry. After around 2 weeks, which is today, I decided to transfer the plant into soil. I put the soil into the cup. Half an hour later, I realised the sprig is not surviving! Oh no... The top of the sprig began to bow down. Arrghh.... In desperation, I put it on music therapy! I put the plant in between the office PC speaker and played classical music. Do you all think I am crazy? Let's see if it survives when I get into office on Monday morning. Keropok, Rosemary is usually very easy to take cuttings from. To get the best results if you are putting the cuttings straight into soil with a sharp knife cut the bottom of the cutting just below a leaf node then strip off leaves from that node and several above it. Stripping leaves off helps to reduce water loss through transpiration. Place the cuting into the soil in the pot water it and allow to drain then put the pot into a polythene bag, blow up the bag and knot it closed. Blowing the bag up keeps the walls of the bag away from the plant and also enriches the air with carbon dioxide which the plant needs for photosynthesis. Some losses of cuttings do occur but the best way of ensuring success is to do about six cuttings at a time, then of course they all take and you have the problem of what to do with the other five. They make nice presents! Next time u come up to KL, I give u a rosemary plant?? Bought a huge big pot for RM10 only. It's thriving in my garden of sorts with the mint and thyme. P/s hope the music therapy works! Hmm... You sound like an expert. I will try it if this one fails. Blowing air into it. That's brilliant. I shall breathe air to my plant! My mum planted mint as sis' place in UK and it grew and grew so quickly. See it's her green fingers. Your weather there should be good for planting herbs! Oh, by the way, the plant looks like it's in limbo. Music therapy continues. Will give it a few days more. does your cup have a drainage hole at the bottom? i don't know why cuttings seem to grow fine in a cup of water but then they get so finicky in soil. adequate drainage and not overwatering are as important as not underwatering. i have learned this from killing many cuttings (and am still learning it). you only need to water if the soil feels dry. i hope your highly cultured cutting survives as it looks so pretty. p.s. i have been reading and enjoying your blogs for a while now. keep up the great work! The old style cloth coffee strainers. Hey, have I seen that design before?